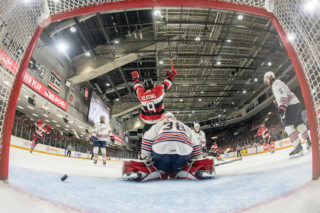 Los Angeles Kings prospect Aidan Dudas (21, 22) connected with Brady Lyle for an overtime give-and-go to lift the Owen Sound Attack past the visiting Barrie Colts 4-3. Sergey Popov (4) tied the score at three with 4:30 left in the third period before Dudas scored his second of the night 2:17 into the extra frame. Daylon Groulx (14) also scored for the Attack while Adam McMaster had a pair of assists. The Bears outshot the Colts 45-17 as Barrie’s Jet Greaves helped his team earn a point with a 41-save performance. Jacob Tortora (15, 16) opened the scoring with a pair of first period goals for Barrie while Aidan Brown (10) tallied late in the second. The Colts suffer a fourth straight loss and sit six points back of eighth place North Bay in the Eastern Conference with a 21-28-3-1 record. Owen Sound improves to 27-23-2-2, four points up on sixth place Kitchener in the Western Conference. The Hamilton Bulldogs battled back from down 5-3 as third period goals from Avery Hayes (6) and Arthur Kaliyev (43, 44) tied the score at five, setting the stage for some Matthew Strome shootout magic. The Bulldogs captain outwaited Mississauga’s Jacob Ingham on a nifty move to the backhand, scoring the lone shootout marker as Hamilton took a 6-5 decision on home ice over the visiting Mississauga Steelheads. Kaliyev potted a pair of goals on the night while Tim Fleischer (6) and Logan Morrison (9) added singles. Rookie netminder Zach Roy made 37 saves including a Thomas Harley penalty shot denial in overtime before stopping all three Mississauga shooters he faced to secure the victory. Liam Ham (8), Cole Carter (32), James Hardie (12), Keean Washkurak (11) and Alan Lyszczarczyk (28) provided Mississauga goals as the Steelheads outshot the Bulldogs 42-33 and went 2-for-5 on the power play. Hamilton pulls to within four points of fifth place Mississauga in the Eastern Conference, improving to 25-25-3-2 while the Steelheads fall to 26-21-5-2. Joseph Raaymakers came within a minute of his third shutout of the season, stopping 37 shots to backstop the London Knights past the visiting Guelph Storm 6-1. The Knights further tightened their grip atop the Midwest Division as 2019 NHL Draft prospect Matvey Guskov (10, 11) scored a pair of nice goals while Adam Boqvist (15), Joey Keane (7), Josh Nelson (15) and Sahil Panwar (5). Rookie forward Antonio Stranges chipped in with three assists while Nathan Dunkley and Liam Foudy each added a pair. Guelph outshot London 38-32 as Domenico Commisso (8) ended their offensive silence in the final minute of regulation. The Knights rebound from consecutive losses last weekend, improving to 38-9-5-1 atop the Western Conference. Guelph falls to 29-15-6-4, six points back of third place Saginaw in the Western Conference. The North Bay Battalion led 2-1 after one before the Sudbury Wolves responded with four unanswered on home ice, defeating their North Bay rivals by a score of 5-2. Rookie defenceman Isaak Phillips (2, 3) recorded his first OHL multi-goal game with a pair of markers while Adam Ruzicka (21) continued a nine-game point streak with a goal and an assist. Macauley Carson (11) and Shane Bulitka (16) added goals for the Wolves while Owen Robinson picked up a pair of helpers. 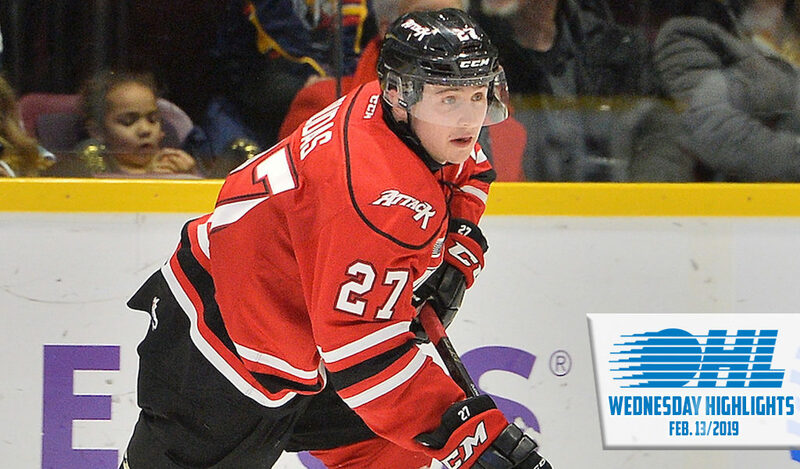 Brad Chenier (24) and Brandon Coe (12) scored North Bay goals while veteran defenceman Nick King had two assists. Sudbury outshot North Bay 42-36, improving to 5-2 against the Battalion this season. The Wolves earn their ninth straight win and pull into a first place tie with Niagara atop the Central Division, owning a 34-16-2-1 record. North Bay suffers its seventh loss in the past 10, falling to 24-25-2-2. The Peterborough Petes rallied back to tie things at three midway through the third period before the Oshawa Generals pulled away on Allan McShane’s (26) power play game winner with 5:32 left in regulation. Oshawa’s fourth straight win saw McShane, Nando Eggenberger (18), Serron Noel (29) and Anthony Salinitri (40) each record a goal and an assist while Tyler Tullio (12) and Brett Neumann (35) also found the back of the net. 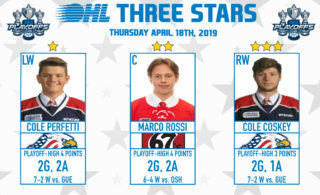 Salinitri suited up in his 300th career OHL regular season game as the Generals outshot the rival Petes 39-22, wrapping up their season series against Peterborough with wins in six of eight encounters. Rookie winger Cameron Butler (13) had a goal and an assist for the Petes while Ryan Merkley (11) and Nick Robertson (21) both had goals. 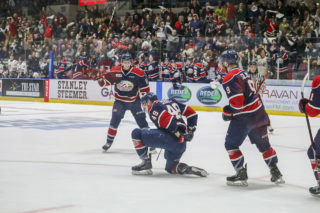 Oshawa has won six of seven, improving to 34-18-3-0 in a three-way tie with Sudbury and Niagara in the Eastern Conference. Peterborough drops its seventh decision in the past 10 contests, falling to 25-25-1-2 for seventh in the Eastern Conference. 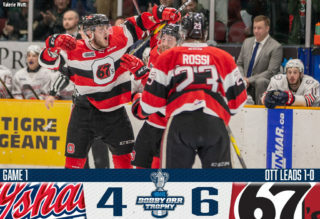 The Ottawa 67’s kept rolling, doubling up the Kingston Frontenacs 4-2 on the road for their 10th win in the past 11 games. San Jose Sharks prospect Sasha Chmelevski (22) earned first star honours with a goal and an assist while Lucas Chiodo (26), Austen Keating (18) and Merrick Rippon (5) also touched twine. Rookie netminder Will Cranley made his first start since Dec. 16th and made 19 saves for the win. Nick Wong (10, 11) scored both Kingston goals as the Frontenacs were outshot 33-21. Kingston suffers a 12th straight loss, falling to 12-41-1-1. Ottawa climbs to 41-9-3-2, improving to 5-0 against Kingston this season. 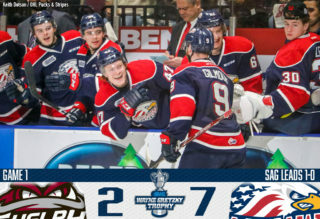 Owen Tippett (25, 26, 27) and Ryan McLeod (17) combined for seven points, with the former netting his second hat-trick of the season as the Saginaw Spirit made quick work of visiting Flint, skating to a 9-2 victory. Albert Michnac (15), Cole Perfetti (23), Blade Jenkins (20), Damien Giroux (23) and Bode Wilde (14) also got in on the goal-scoring frenzy as the Spirit took a clean sweep of the Firebirds on the season series, improving to 8-0 against their cross-state rival. Jenkins joined McLeod in finishing the night with a goal and three assists as the Spirit outshot the Firebirds 50-33 and went 2-for-3 on the power play. Riley McCourt (6) and Jake Durham (33) both scored for Flint in the loss. 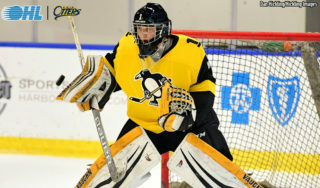 Saginaw rookie Tristan Lennox improved to 6-1-1 on the season, making 31 saves in the win. The Spirit earn their fifth straight win, improving to 35-14-2-2 to sit two points back of first place Sault Ste. Marie in the West Division. Flint falls to 10-42-4-0.